But a recent study by Mint Jutras refutes this common fear and finds that previous statistics on ERP implementation failure rates are outdated. Instead of uncovering proof positive that most ERP implementations fail, the study found the opposite to be true. Most ERP implementations actually succeed, and those that fail do so because of problems with people and process, not the software itself. 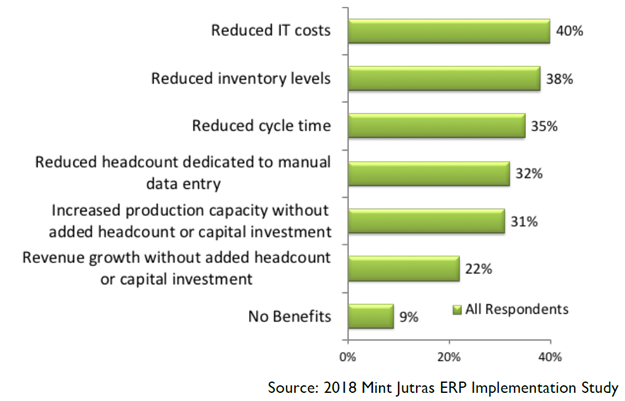 In November 2018, Mint Jutras conducted a study of ERP implementations among 315 manufacturers and distributors, focusing on scheduling, costs and return on investment (ROI). The study, commissioned by independent research firm Ultra Consultants, surveyed companies of sizes ranging from $25 million to multi-billion dollars in revenue with both recent and mature ERP implementations. The study found that while 67% of respondents called their ERP implementations a success and 31% called their implementations a partial success, only 2% said their implementations were not successful and just one respondent called its implementation a failure. 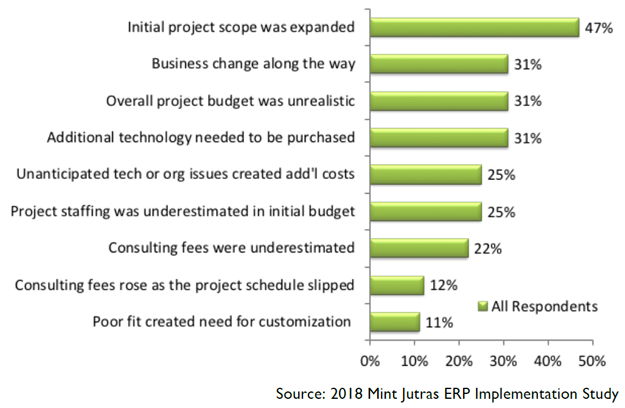 Based on the study, Mint Jutras concluded that many firms are meeting cost and ROI projections with their ERP implementations but may be setting these expectations too low. People and process are the primary reasons for ERP implementation success, not software. Top management support and change management are key factors in successful implementations. Inadequate business processes, re-engineering and poor project planning are reasons for lack of implementation success. A significant number of manufacturing and distribution companies overrate their success and ignore additional attainable returns. According to Mint Jutras, companies embarking on an ERP implementation should always set goals first and those goals should form the basis of ROI expectations. Furthermore, Mint Jutras recommends that any company looking to implement an ERP solution should always identity specific, quantifiable goals, regardless of whether the project is a new solution, a significant upgrade or a replacement of an existing system. 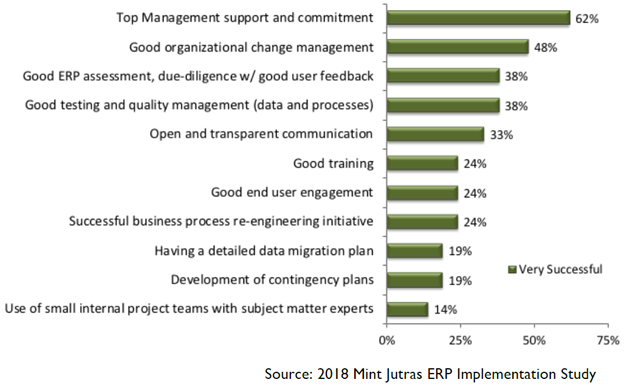 While the first two goals are most directly tied to ROI, Mint Jutras was surprised that less than half of survey respondents chose these as their top goals for ERP. Perhaps most important is Mint Jutras’ recommendation that if your current ERP solution is not meeting your goals, or if you never set any goals in the first place, it may be time to audit your solution to see if it’s doing everything it can for your business. If your current solution is not helping your company compete successfully, it may be time to replace it. Companies of different sizes set different implementation schedules based on when they will begin to see quantifiable results. Some companies go live all at once, while others have a more incremental go-live schedule. Large multinational firms may go live with a single division. To account for this variability, Mint Jutras studied expected and actual go-live milestones based on company size, and then asked survey participants if their schedule expectations were met. The survey found that implementations in SMB, midsize and large companies were faster than expected, but were slower than expected in very large firms. Even though Mint Jutras believes that companies who were most aggressive might have been somewhat optimistic, they still were able to go live much faster than companies with moderate or over a year expectations. Mint Jutras recommends that it is better to be too fast than too slow, and that companies shouldn’t shy away from bringing in a third-party expert to help plan ERP implementations. 41% of participants stayed on or under budget. 35% were less than ten percent over budget. 26% went over budget by more than ten percent. Mint Jutras also found that the percentage of companies on or under budget increased for those with aggressive go-live expectations. When participants were asked to identify the causes of implementation budget overruns, the top answer was that the initial project scope was expanded. This is another reason why companies should define a realistic project scope at the beginning. Most of the survey participants rated their implementations a success, and aggressive implementations were twice as likely to have exceeded their goals than companies that expected implementations to take over a year. Mint Jutras studied the factors that led to both success and failure. Support of top management and good organizational change management topped the list of success factors. Among survey participants who reported implementation failures, the top two reasons given were inadequate testing and inadequate business process re-engineering. Mint Jutras points out in their study that these skills go hand in hand but may not be present in an organization. Rounding out the top five reasons given for failure were inadequate training, lack of planning and readiness assessment and user resistance to change. Mint Jutras recommends that testing and training can be blended. 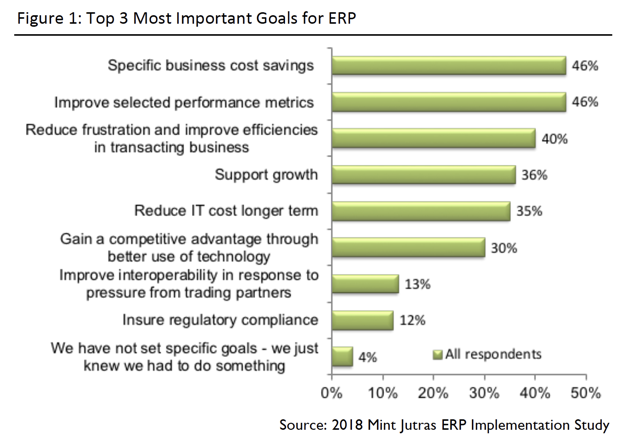 In the study, Mint Jutras defined ROI as the time it took a company to make back 100% of their initial cost of ERP though cost savings or additional revenue. The results? 85% of the survey participants projected timelines for ROI and 82% had achieved their ROI projections. The study also found that companies who had set a more aggressive implementation schedule were more likely to achieve a return on their investment. The average time to ROI for all survey respondents was just over two and half years. Companies with longer ROI timelines beat their estimates, but still took over three years to achieve it. Survey participants were asked to select all the ways that they achieved ROI. Most only selected a couple of areas. The most commonly reported areas of ROI were reduced IT costs and reduced operations costs (inventory levels, cycle time and increased production capacity). However, the small number of ROI areas reported in the survey led Mint Jutras to conclude that many companies are not realizing all of the ROI benefits that are possible. Companies appear to be satisfied with their initial ROI and may not be actively looking for other sustainable returns. According to Mint Jutras, ERP can help companies in many additional areas, including improved data accessibility, improved inventory accuracy, increased collaboration and improved on-time deliveries. Mint Jutras recommends that companies look beyond basic ROI when they consider an ERP solution and consider these additional benefits. In the early days of ERP, it was common for companies to go over budget with their implementations, and many implementations did fail. However, in today’s manufacturing and distribution industries, high ERP failure rates due to scheduling, costs and ROI are a myth. Two thirds of the survey participants rated their ERP implementations as successful, only 26% went over budget by more than 10%, and 82% achieved their projected return on investment. That is not to say that implementing ERP is easy. It can be difficult and disruptive to your business and requires a different set of skills than those used to run a business. 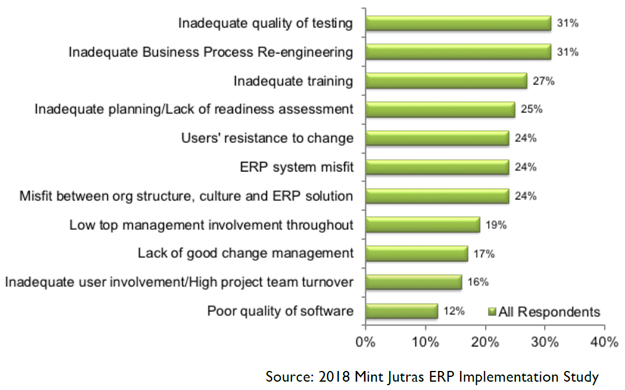 Based on this new study, Mint Jutras recommends that companies set high expectations for new ERP solutions and, for companies who have already implemented ERP systems, it may be time to go back and see if the solution is living up to its potential.